At Treasure Coast Window Fashions, we specialize in a wide range of window treatment motorization systems, ranging from hard-wired to battery operated solutions. Many varieties of blinds, shades, and drapery can be motorized. Often, we can add motorization kits to your existing window coverings. There’s never been a better time than today to motorize your window treatments! PowerRise 2.1 with Platinum 2.1 Technology allows you to raise or lower window coverings individually or in groups using a small and convenient remote control. PowerGlide 2.1 with Platinum 2.1 Technology uses a remote control to tilt and traverse vanes and sheers on your, Silhouette, Pirouette, Luminette and Alustra Luminette Privacy Sheers. Hunter Douglas hard-wired systems with Platinum 2.1 Technology integrate with other home automation systems offering simple wiring solutions that are operated with a wall switch or remote control. Exclusively from Hunter Douglas, the Platinum Technology Accessory family provides convenience and peace of mind with your motorized window coverings. Why Motorize Your Window Treatments? Added convenience. Some blinds and shades are very large, or in difficult to reach places such as up in skylights or behind bathtubs. Child safety. 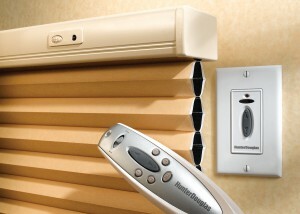 Motorization improves the child and pet safety of your window treatments. Even though much improvement has been made to window treatment cord systems, they can still pose a danger to kids and pets. Motorization removes cords completely, lowering the risk. Automated Window Treatments Easier Than Ever! Control Your Hunter Douglas Shades and Blinds with Your iPad!